I got out of the truck and stomped my feet in a happy dance! It was good to be there! 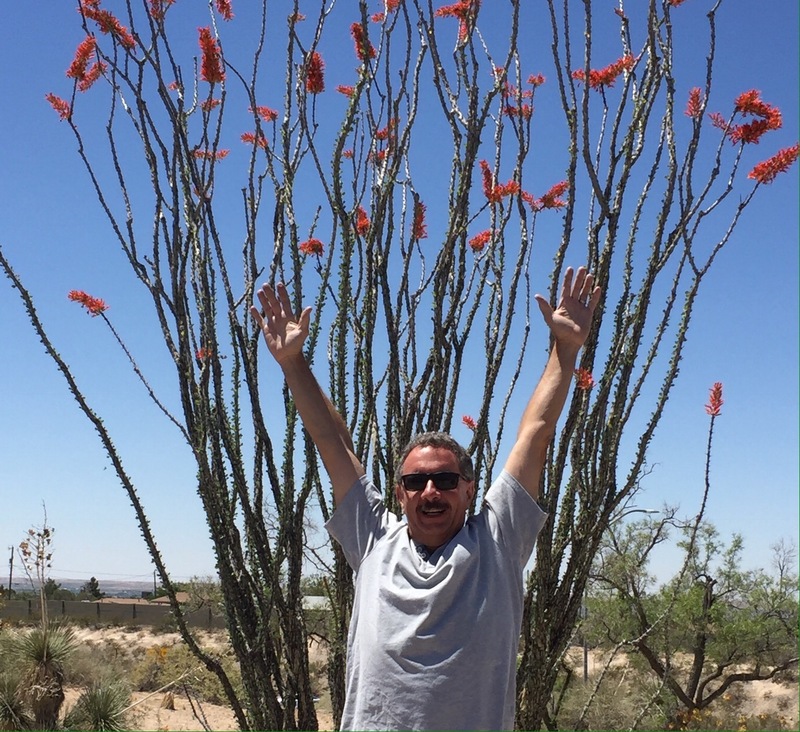 The branches of the ocotillo cactus were clelbrating along with us! 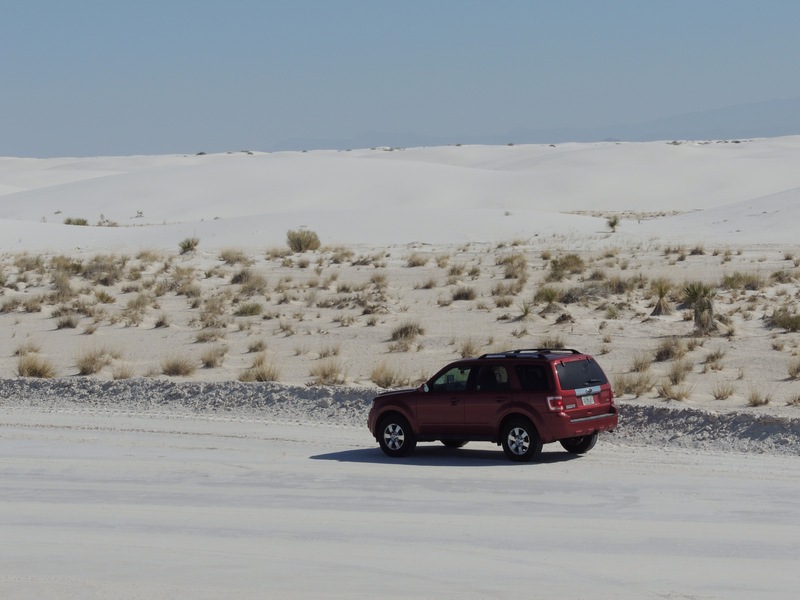 We set up base camp in Las Cruces on Wednesday, as we wanted to see White Sands National Monument the following day. Wednesday evening, we did a little exploring. 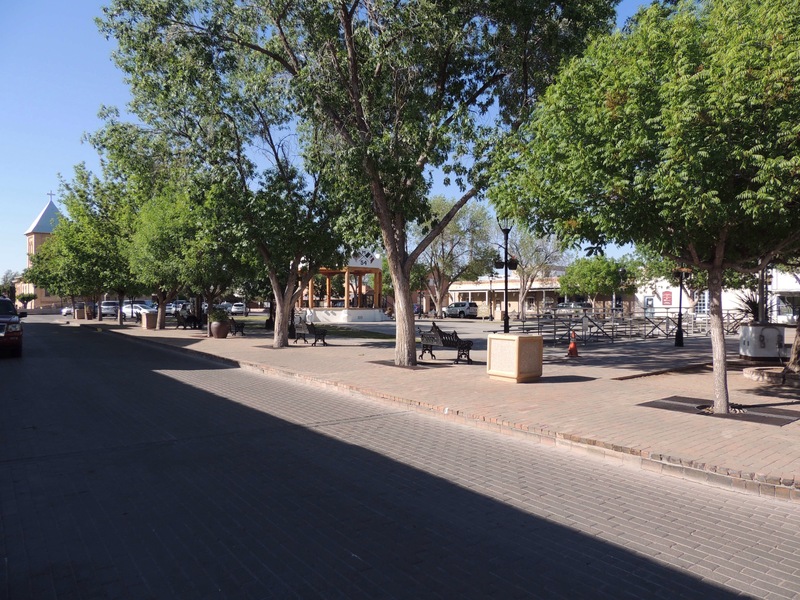 This is the town square in neighboring Mesilla, where the Gadsden Purchase was signed in the 1850’s. That transaction was when the U.S. bought southern New Mexico and Arizona from Mexico, mostly so a southern transcontinental railroad route could more easily be established. As a result, the land that Tucson, Bisbee and Yuma sit on are part of the United States. 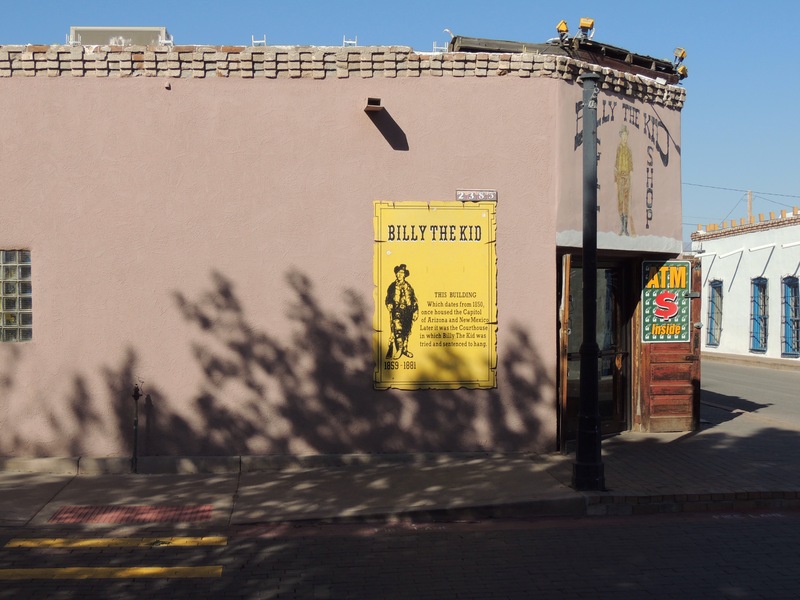 This building, now called the Billy the Kid Gift Shop, was once the Capitol of New Mexico and Arizona. It was also where the famous outlaw was found guilty and sentenced to hang in 1881. He escaped from the jail and was killed later that year. 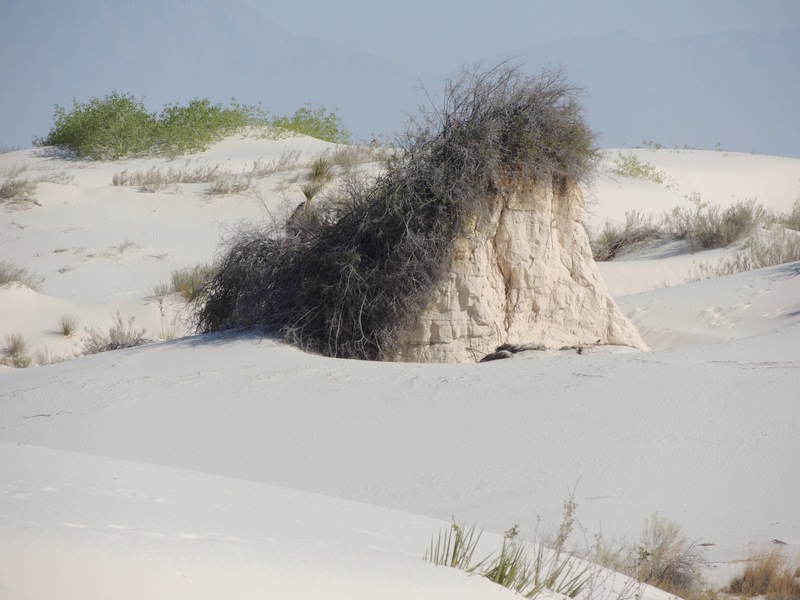 The temperatures had been steadily rising as we journeyed west, so we knew we needed to get out to White Sands early on Thursday. 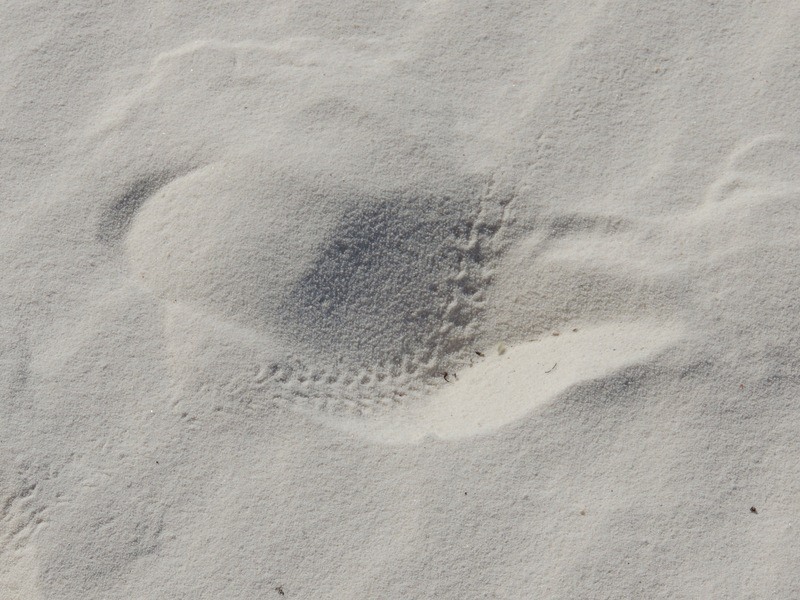 Having spent plenty of time on the sand at Sleeping Bear Dunes in Michigan, we were expecting White Sands to be a lot warmer than it was. The majority of the morning was actually a bit chilly! We drove the loop road and got out at several stops to climb up on top of the hills to get a better view. The dunes seemed to go on forever! This area is so vast, it can easily be seen by astronauts from space. This national monument sits in a large basin that is bordered by mountain ranges to the east and west. Despite the barren appearance of the landscape, signs of life were everywhere. 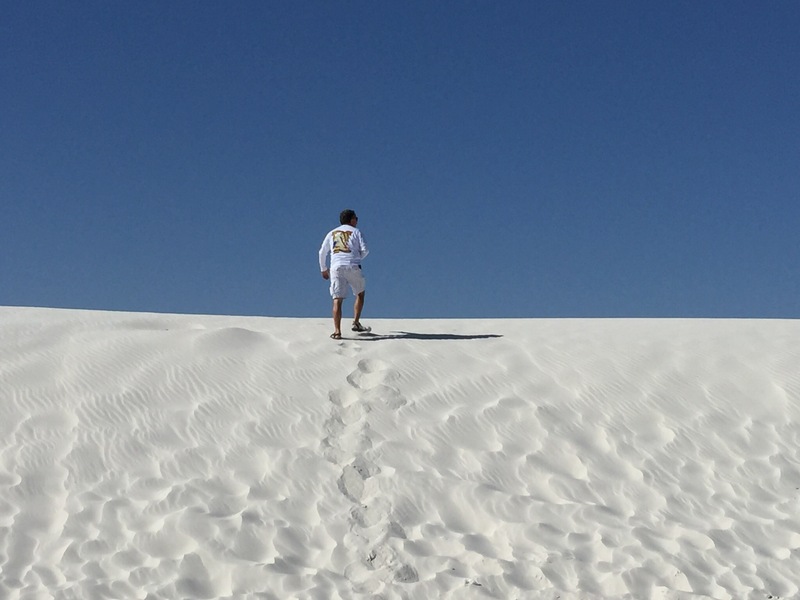 The sand…actually gypsum…was cool to the touch. The roadway through the dunes was hard packed sand and was well maintained. 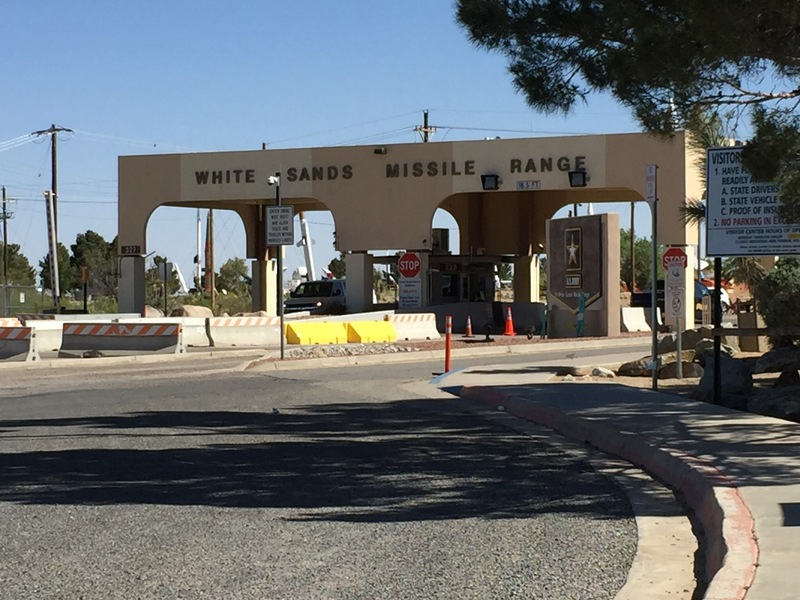 As we drove around, Diana read the park literature to me that explained the proximity of the monument to the nearby White Sands Missile Range and Holloman Air Force Base. Occasionally, unexploded bombs land in the monument, so there are warnings not to pick anything up. Also, they advise that GPS devices will occasionally be blocked, as well as US-70 being closed for missile testing a few times a week. Several times, the lady in our Garmin would announce “Lost Satellite Reception”…even though we has an unobstructed view of the sky in all directions. In addition to that, we kept hearing an occasional boom. There definitely was some strange things happening out there. 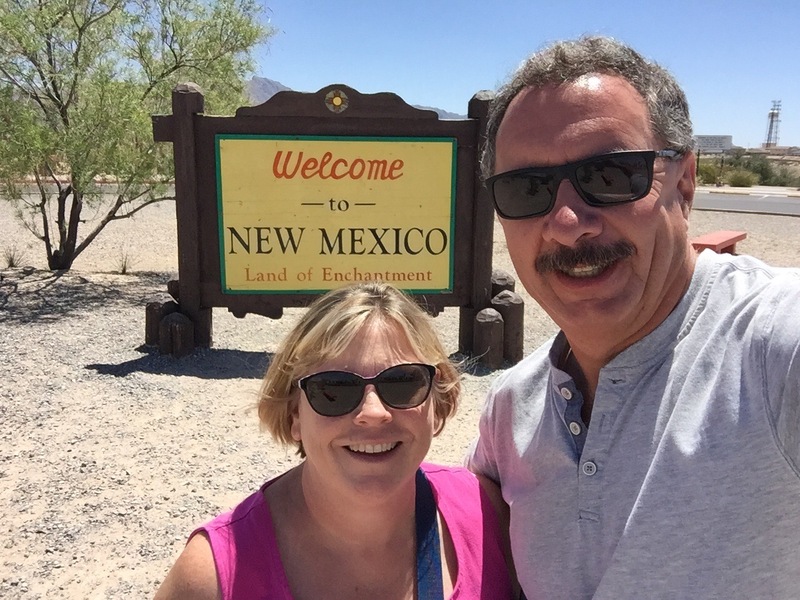 After visiting the monument, we drove north to Alamogordo to see what was there. We weren’t very impressed with the town, so we headed back southwest. We tried to catch a glimpse of the landing strip at Holloman AFB where the Space Shuttle Columbia landed once, even taking a dirt road along the perimeter of the base. No luck on that one. The Garmin continued to announce that the satellite reception had been lost….and we heard more booms. 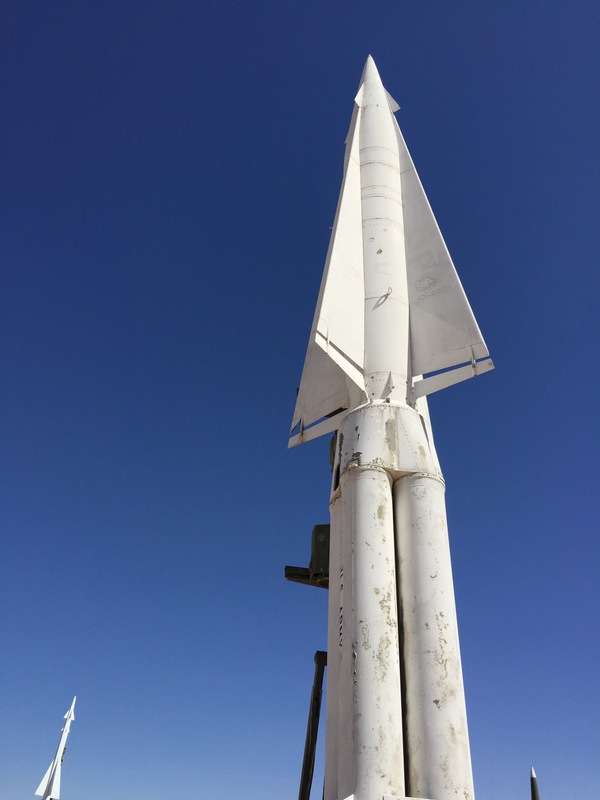 Heading back down US-70 towards Las Cruces, we spotted a sign for a missile museum at White Sands Missile Range. With all the strange goings on, our curiosity got the best of us…so we headed towards the base. Yes, I realize that we had our fill of plane, ship, and automobile museums on this trip…but this was missiles! Getting on the base was easier said than done. We were subject to a security clearance check in a building before we reached the gate, then our vehicle was going to get a good going over. We chose to leave the vehicle parked outside the gate and walk in. It was nice to know that we passed the security clearance! The display area consists of two museum buildings and an outdoor display area. We started out in the main museum building, which we found to be fascinating. This is a WAC Corporal rocket. One of these launched from White Sands in the 1940’s and was the first manmade object to leave the Earth’s atmosphere. I found this map interesting. 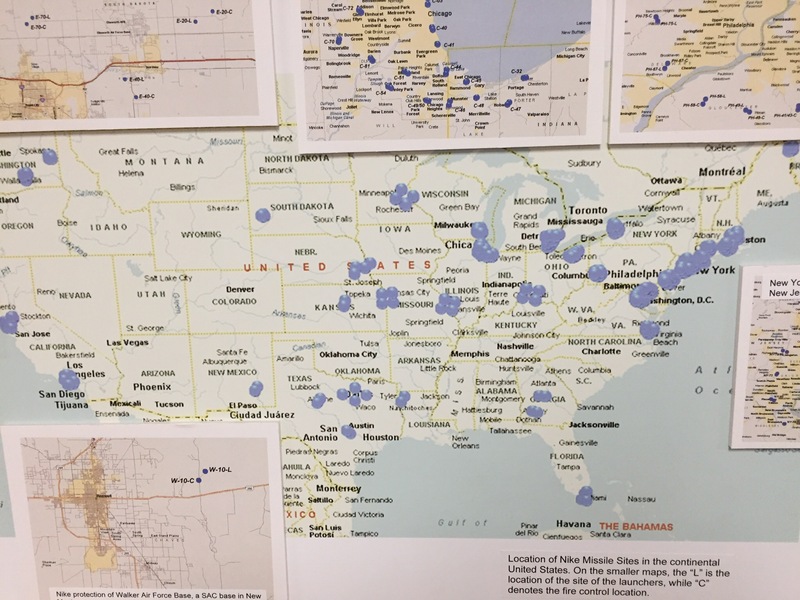 It showed the locations of the Nike missile sites that formed the Ring of Steel around important locations during the Cold War. I never knew that Detroit and Chicago actually had missiles, nor did I know that the U.S. left so many major cities unprotected. I did know my hometown had a lot of Russian missiles aimed at it though! 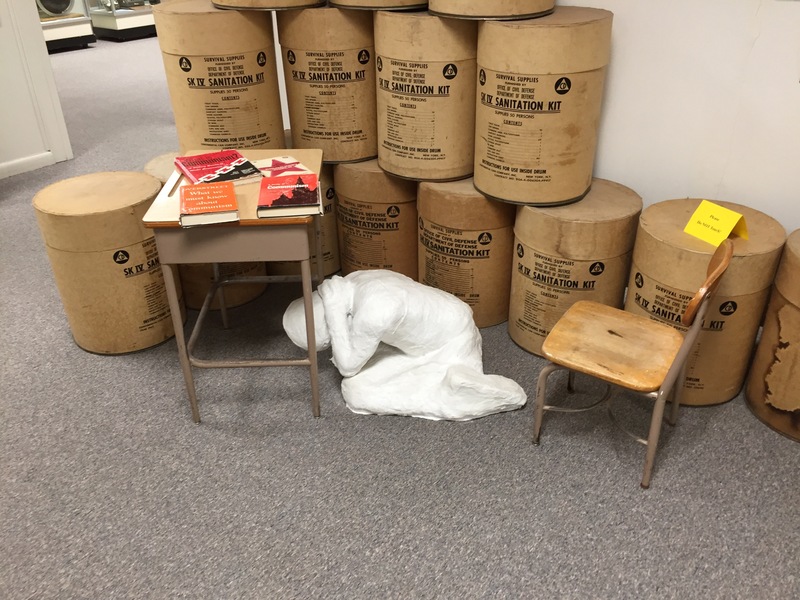 So in an odd sort of way, I found this display comforting. 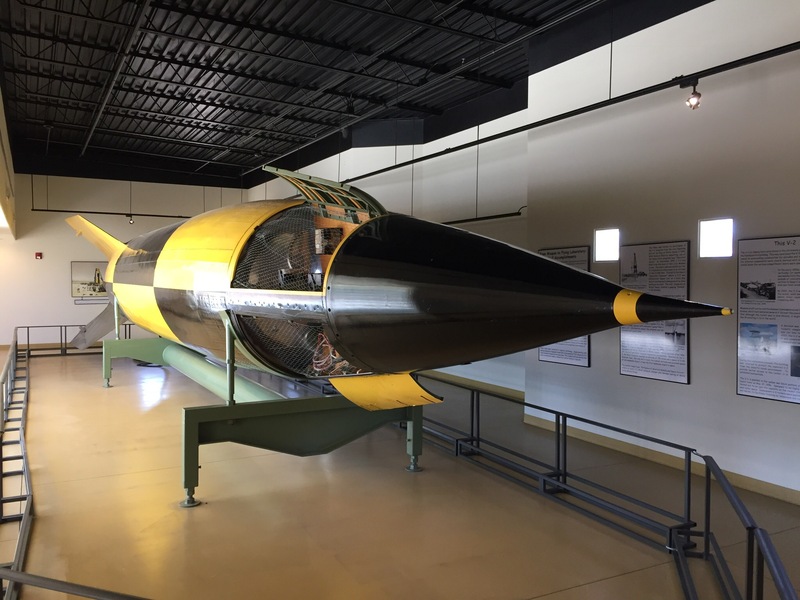 The other building at the museum houses a restored V2 rocket. This is one of the rockets the U.S. captured from Nazi Germany at the end of WWII. 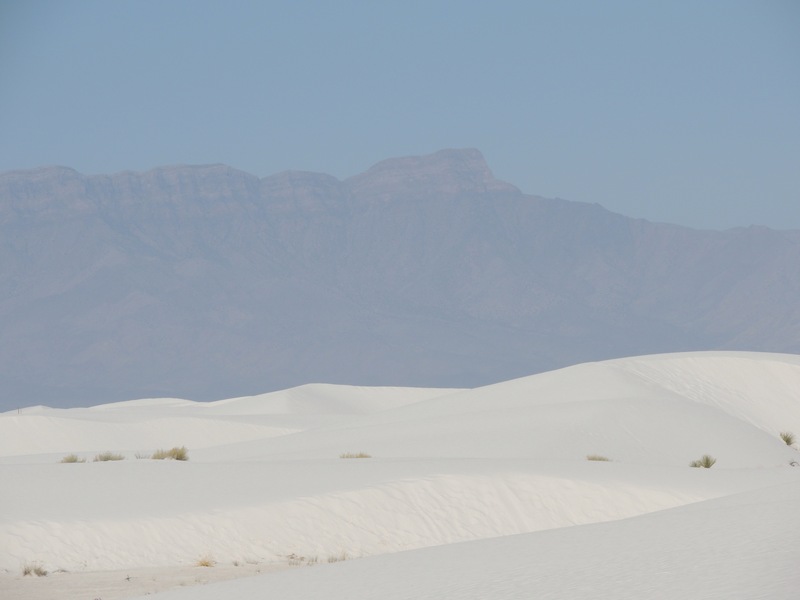 The scientists who developed them, including Werner von Braun, surrendered to the U.S. and were brought to White Sands to assist with our missile program. The knowledge we gained from the Germans and these rockets allowed us to become the superpower we are today. From there, we toured the outdoor display area. 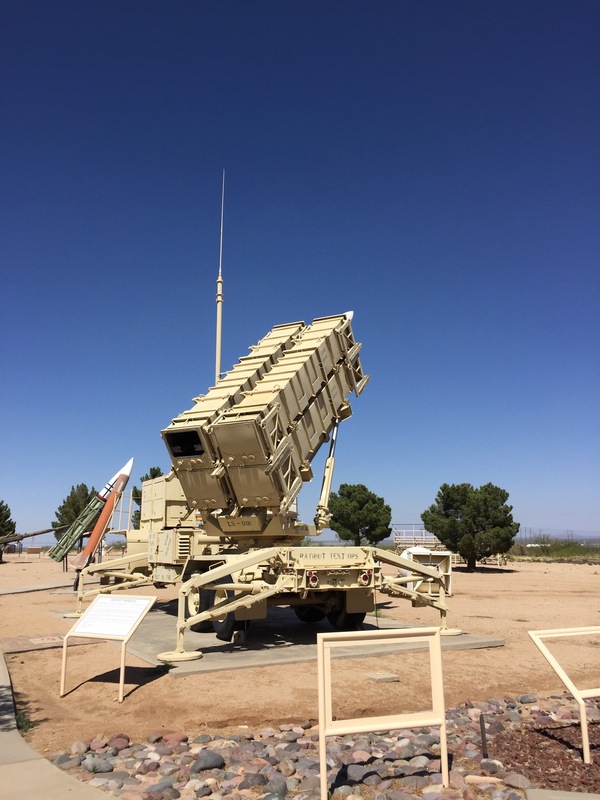 Remember the Patriot missiles from the Gulf War? Here is a great example of one. 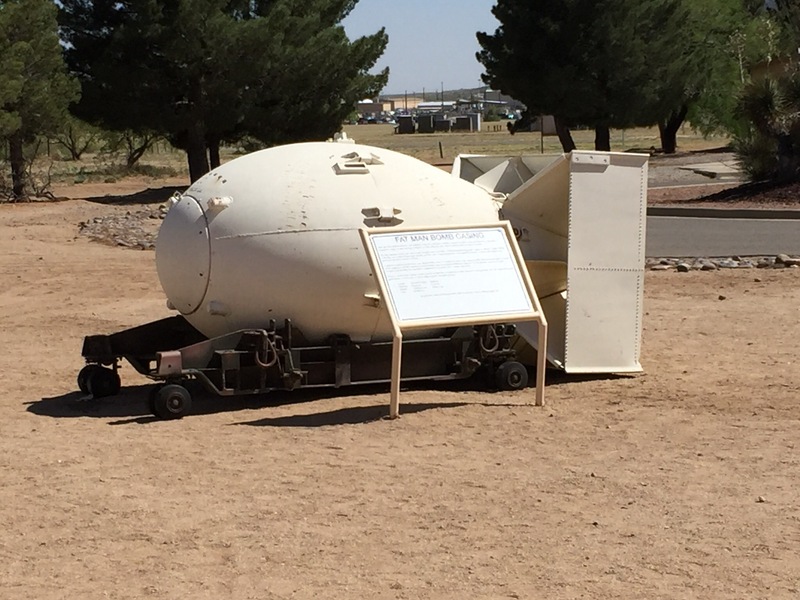 This is a Fat Man bomb casing…the same as the one that was dropped on Nagasaki, Japan. 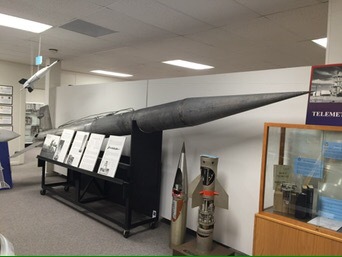 And a Nike Missile…the type that protected our cities in the Cold War. While the display was sobering, it was indeed ‘the real deal‘. None of it was sugar-coated, therefore we found it to be immensely interesting. As we were walking around the displays, we heard more booms. This is an active base and the testing goes on with regularity. We can only hope that it will keep us out of harms way. We only lightly touched on New Mexico, and we will be sure to see more of it in the future. Stay tuned as we continue to head west!